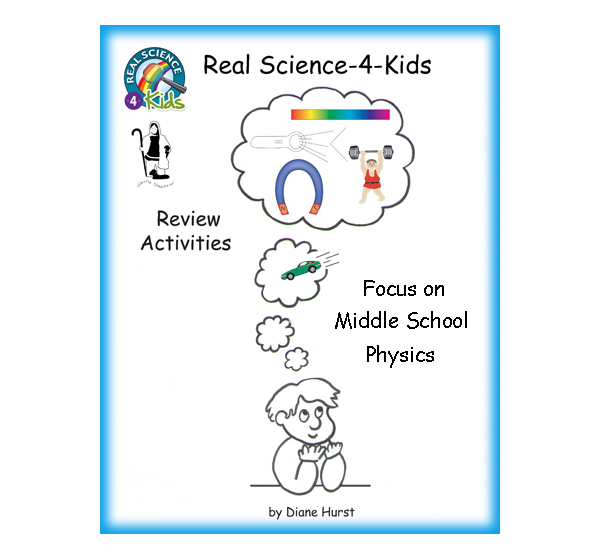 Gravitas Publications has a series of science textbooks that are designed to be used with children in upper elementary/ middle school grades (5 - 8), to teach important basic science concepts. 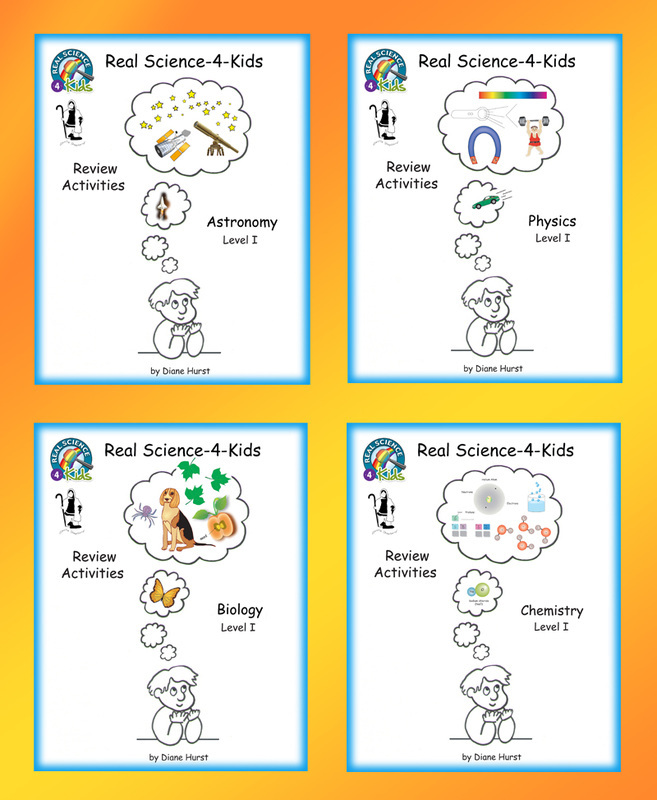 This company has been expanding to include textbooks for younger and older grade levels, and now also offers full-year grade level science courses covering a variety of science topics. 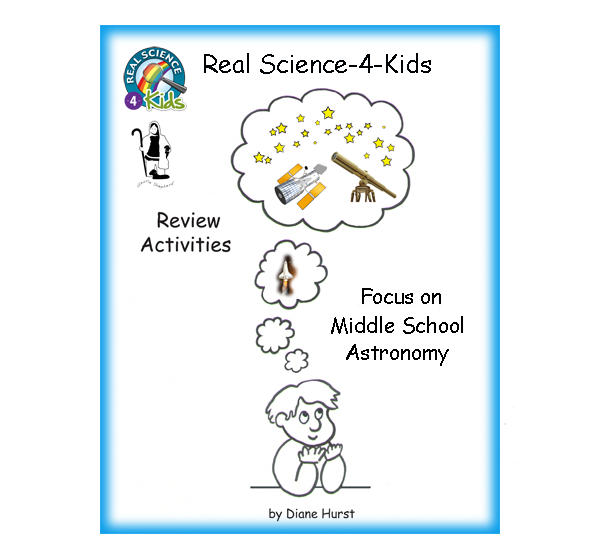 You can see their full line of science materials at www.gravitaspublications.com. 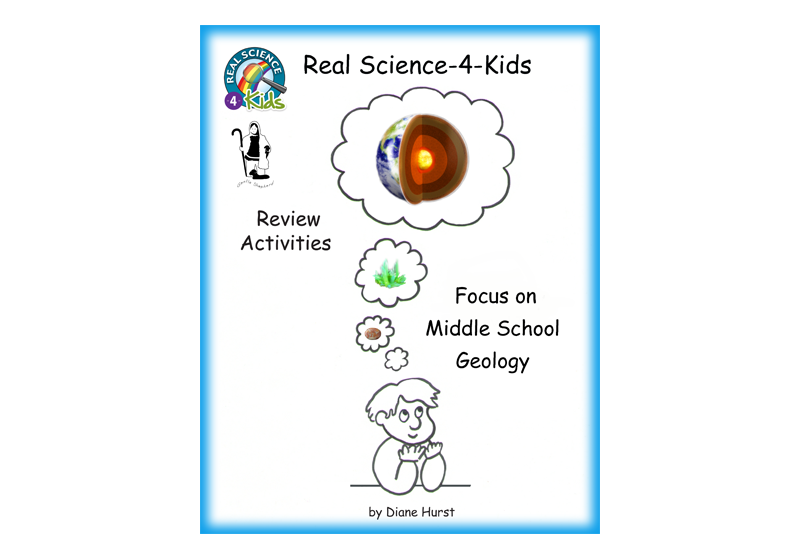 After writing review activities for my own family's use (see the story below), I wanted to make these available to others who are doing science studies with Focus On Middle School textbooks from "Real Science-4-Kids" (Chemistry, Physics, Biology, Geology, or Astronomy) by Dr. Rebecca Keller, Gravitas Publications. With Dr. Keller's permission, we have published these e-books as part of our Gentle Shepherd curriculum. There are review questions and instructions for making drawings and misc. 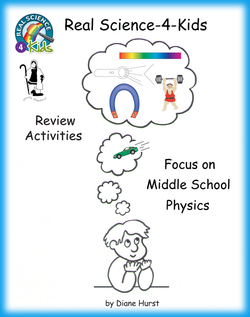 other activities, to reinforce the vocabulary and concepts in the "Focus on Middle School" Real Science-4-Kids Chemistry, Physics, Biology, Geology, and Astronomy books. 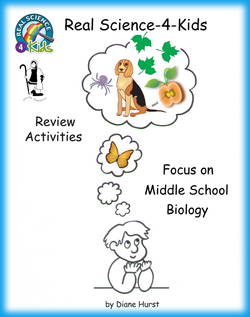 There are questions to read aloud with sections of the text, plus a variety of other review activities-- includes assignments for drawing pictures/diagrams, and additional suggested biology writing projects. This ebook has 76 pages. 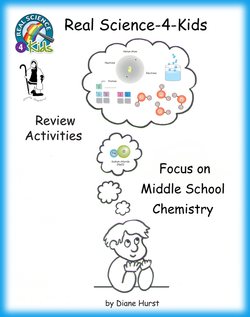 There are questions to read aloud for sections of the text, plus a variety of other review activities-- includes assignments for drawing pictures/diagrams, and a supplemental chemical elements study that uses research and online videos. This ebook has 70 pages. If you would like to have these Review Activities Science ebooks in CD format, please see more info HERE. 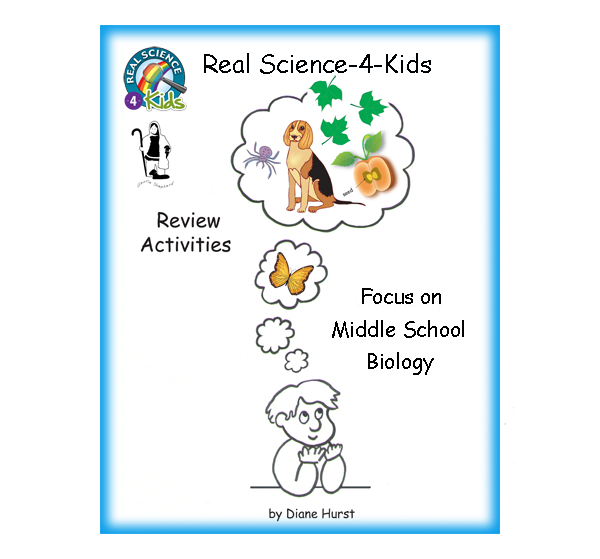 There are questions to read aloud with sections of the text, plus a variety of other review activities-- includes assignments for drawing pictures/diagrams, and an additional suggested research report about a scientist. This ebook has 65 pages. 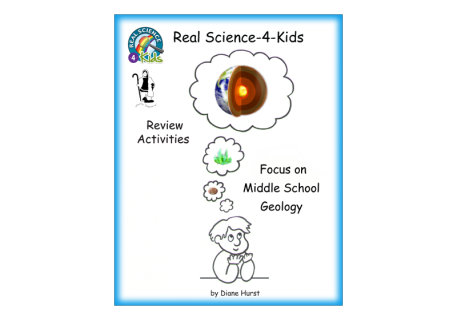 There are questions to read aloud with sections of the text, plus a variety of other review activities-- includes assignments for drawing pictures/diagrams, and additional suggested geology writing projects. This ebook has 66 pages. 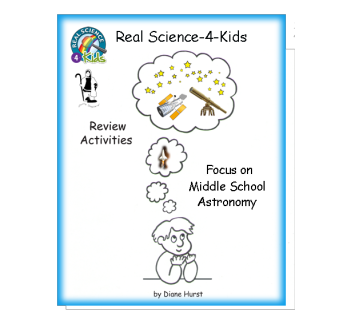 There are questions to read aloud with sections of the text, plus a variety of other review activities-- includes assignments for drawing pictures/diagrams, and an additional suggest research report about an astronomy topic. 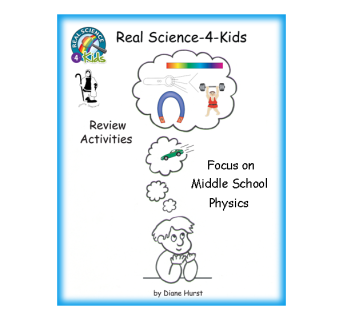 Coming across the Real Science-4-Kids books was what made it possible for us to have a "real" science program in our artsy family's homeschool. The full-color cartoon illustrations and informal font style made science seem less scary! 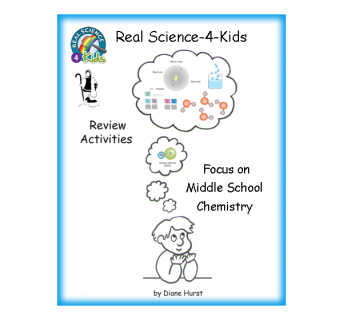 When we first started using these books, I was so excited-- finally there was a science curriculum that could help me understand basic science concepts. Oh, yeah-- and the children, too! 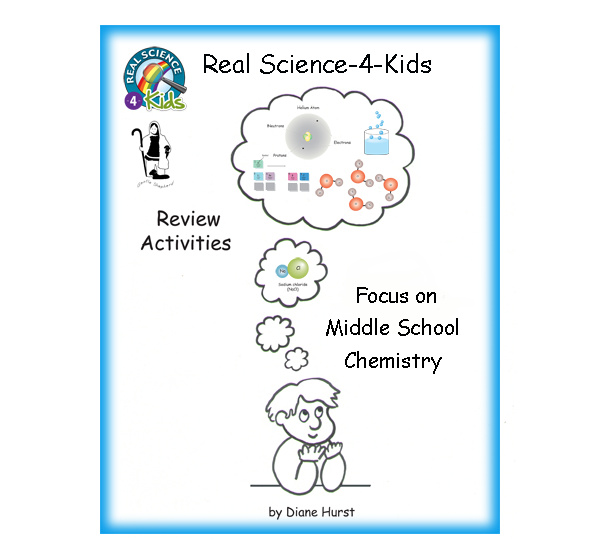 The way these books are written simplifies science and gives examples that can be visualized. I felt like the light bulb had turned on, and we really enjoyed learning from these books. To try to get the most learning and retention possible, we also used some review activities-- often this meant drawing our own pictures to illustrate a concept, and always involved some questions for review. I read ahead in the books, and wrote up some questions (and answers) that would help us review the vocabulary and concepts that are explained in the text. We divided the book into reading sections, and each day read one section (made up of either one or several internal chapter divisions, depending on the length of the reading). Before reading, we always went through some review questions, covering things we'd already read about. Then after reading, we had questions about the section that we'd just read. This turned out to be a nice routine-- asking the questions before and after reading "framed" our studies. With each reading section, we also did either a drawing or other activity that would help reinforce the concept/vocabulary we had just read about. We also included the science experiments suggested in the RS4K teacher's manual. There is an experiment for each chapter, so it was easy to schedule these in, and not do the reading and questions etc. on the experiment day. These came about once a week, but not on the same day each week. We did the experiment after each chapter was completed, about once every four to eight days. This was a great way to learn science, and this subject became not so "spooky" to me and my family. I hope these Review Activities ebooks will be a help to others in their own studies.